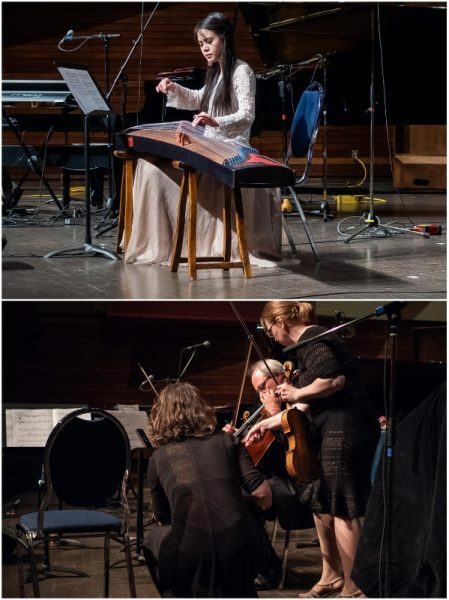 Jing Xia (top) plays a guzheng, while the Atlantic String Quartet all play the cello. The Atlantic String Quartet began the evening offerings with a work by Andrew Staniland. For these two listeners it was a vibrant and virtuosic development of Kepler’s music of the spheres. Lots of fast lines and fast string acrobatics with some humorous staging. It was European through and through. The second work was by Raven Chacon entitled “The Journey of the Horizontal People’… who travel from west to east across the written page contrary to the movement of the sun. It seemed to us to methodically unravel the conventions of tuning and directionality. Dare we call it a post-colonial dismantling of assumptions of what music might be. The third work was by Rob Power, which had been intended for performance at Cape Spear. The musicians emerged from various areas of the hall and reassembled on stage. The players then messed with the cello using sonic options available to the instrument, accompanied by a recording captured at Cape Spear. Jing Xia next performed solo on her instrument the guzheng. She and Clinton Ackerman met at Sound Symposium two years ago and have continued to work together on collaborative graphic and verbal scores. The work highlighted Jing’s virtuosic skills on her beautiful instrument. Then came Subhira, a band from Chile, who presented a highly energetic rhythmic mix of Afro/Latin infused sounds. The combination of keyboards violin, electric cello, drums and voice supercharged the hall and the crowd. These listeners left smiling from Ear to Ear. Reinhard Reitzenstein is currently Associate Professor at SUNY, Buffalo where since 2000 he has directed the Sculpture Program. He is represented by the Olga Korper Gallery, Toronto, and Indigo Art, Buffalo, NY. Reinhard has been with Sound Symposium since the very beginning, way back in 1983.